Here we are, 14 years and counting - and the definitively exposed 9/11 hoax still lives on ... on TV, that is. In reality, a vast proportion of the world's population - most probably a majority by now - knows full well / or strongly suspects that something is amiss with the official version of the events of September 11, 2001 - as presented by the news media. If you have come here for REAL information about the 9/11 hoax, I dare say you have done the right thing. Welcome. 1- The 9/11 imagery aired on TV was nothing but a prefabricated movie production, complete with actors in the role of eye-witnesses / firefighters /running crowds, etc - much like your average Hollywood "disaster movie". The made-for -TV 9/11 footage was split into a number of short clips and sold to the TV audience as 'newscasts'. 2- No commercial airliners were hijacked or - much less - crashed into the WTC towers, the Pentagon or the Shanksville field. The few TV clips depicting 'crashing airplanes' were computer-generated images, as has been comprehensively demonstrated in every imaginable manner - and beyond reasonable doubt. 3- The WTC complex was demolished behind a military-grade smokescreen enveloping the area - so as to hide the proceedings from public view. All existing 'tower-collapse" images (as aired on TV and as successively released over the years as purported "private /amateur material") - whether in video format or still photography - have, in turn, also been thoroughly analyzed and exposed as digital forgeries - due to a long array of irreconcilable inconsistencies, contradictory collapse dynamics and forensic / photographic evidence. 4-No "3000" people were trapped in the top floors/nor perished in the WTC towers. More than six years of relentless investigations 'in search' for the purported victims of 9/11 have failed to formally identify (via public records, verifiable documentation or any other means) one single alleged victim of the events of September 11, 2001. We (the Cluesforum members / contributors and founders), are fully aware that the above findings may be - to our new forum readers - difficult to process and probably even overwhelming in its implications. We can only hope that you will take the time to peruse our research with an open and thoughtful mind - and that you will come to appreciate and acknowledge the depth, scope and validity of our collective, longstanding efforts at establishing the true facts behind the most audacious media hoax of modern times (as well as highlighting its wider motives and long-term social consequences). Again, welcome to Cluesforum - and enjoy your stay. We hope you will find it a positively enlightening experience. Yup, folks : tomorrow is the 15th anniversary of the Silliest Mass Deception of modern times, namely 9/11. Please post (here on this thread) your thoughts about it all - as well as your ideas and advice about how we could enhance / improve the diffusion of our hard-earned learnings of the Great 9/11 Hoax to the general public. ... and not to be too grabby for your time, but, I'd say the two most major things we could do involve you. This is a day for the dull minded and intellectually asleep populace to post Falling Man whines on facebook and sound so noble and serious. They pride themselves on what good people they are to "remember" something that they never showed the slightest interest in actually learning about. I'm sure most of us here would love to be challenged on our views by individuals with a modicum of curiosity about them instead of simply being attacked or called morons, how tedious. What can one do with the True Believers, or people who believe in the Official story of 9/11? I feel sorry for the Believers and have pity on them because they are constantly being traumatized through the media by 9/11, over and over. Human beings must be continually traumatized in order to stay mind controlled. If we are to move forward we have to stop congratulating ourselves for waking up and stop making fun of those still being mentally tortured and under mind control. Let us not forget that 9/11 is first and foremost, imo, a Fear Based Mind Control Program. Mind Control. Let us not blame the victim. Looking forward it would then seem prudent to investigate effective methods for breaking mind control. 9/11 brought our attention to the ability of the nutwork to organize and implement these massively giant campaigns of fear and terror. Let's stop underestimating their mind manipulation abilities and instead try to understand them. This is where I see great changes in the future. Think if we had the knowledge of how their most effective mind control techniques worked? Then we could figure out how best how to break them. In other words, we could disable their weapons. "The 9/11 Memorial & Museum will soon lead the nation and the world in commemorating the day that changed our lives forever. While fifteen years have passed since 9/11, we continue to keep our pledge to Never Forget by honoring those killed and observing the anniversary of the attacks. On Sunday, September 11, 2016, a private ceremony will be held on the 9/11 Memorial for family members to mark the anniversary. The Memorial will be closed during this time and will reopen at 3:00 p.m., allowing the public to pay their respects. Visitors may also gather on the Memorial to view Tribute in Light, which will illuminate the sky later that evening. The Memorial will remain open until midnight. Whether you are here in New York or observing the anniversary elsewhere, there are many ways you can commemorate 9/11 no matter where you are. Thank you for joining us in paying tribute on this important day of remembrance and reflection." ... by remaining (mostly) closed to the public ??? Kham » September 11th, 2016, 7:06 am wrote: What can one do with the True Believers, or people who believe in the Official story of 9/11? This is an excellent post that shows far more compassion than mine. The frustrating thing is not to have our ideas considered and rejected but having them dismissed without even being heard. What is the way into a closed mind, particularly one that considers itself to be intelligent? Yes agreed. It's the clowns in the so called "government" and media, and the likes of Fetzer, that deserve the ridicule, not those they are charged with brainwashing. Feeling a bit patriotic today, thought I might get a 9/11 I-Beam and put it up in my front yard for a timely and neighborly memorial, but sadly I am too late. The program ended one month ago. The i-beam from the image below is supposed to be from twin towers collapse. The city of Kennewick WA acquired it through the Port Authority program. The Port Authority of New York and New Jersey has given away more than 2,600 pieces of steel and other artifacts left behind when terrorists flew two airplanes into the twin towers of the World Trade Center on Sept.11, 2001. For 15 years, piles of twisted steel, damaged vehicles and subway cars and other objects were stored inside a hangar at John F. Kennedy Airport. The program ended in August 2016. Most of the artifacts went to community groups, museums, fire stations, town halls and military bases from Manhattan to Afghanistan. The rest is housed at the 9/11 Memorial and Museum at the World Trade Center site in the state museums in New York and New Jersey. The Port Authority, in 2006, started a formal program to disperse the artifacts. Because it comes from a crime scene, the release of each piece and to be approved by a federal judge. 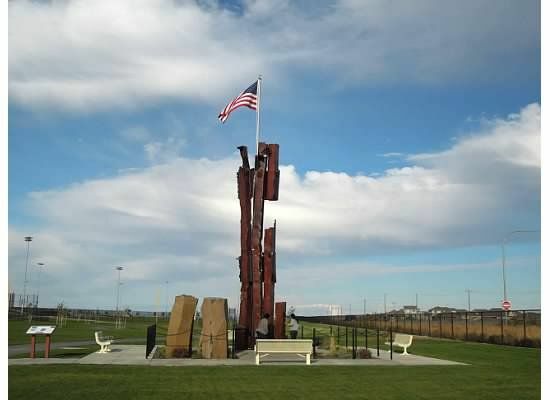 The key criteria was that the steel had to be open to the public, but the Port Authority did not set requirements for the design of the memorials. The steel can be left outside in the weather. “It’s not meant to be pretty.” One former Port Authority official said. “It’s meant to be real.” You can search for each town, village, city, overseas military base that has received an artifact since 2006. Meant to be real, huh? Well, Port Authority, are the steel i-beams really from the WTC's or not? 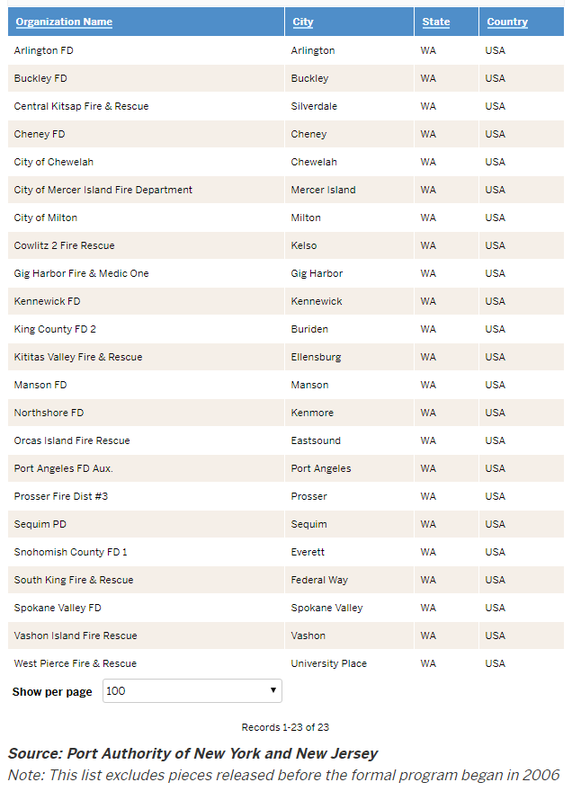 Here is a list of places that have i-beams from the WTC's in my state of Washington. Out of the 23 sites, 20 are fire departments. Fire departments STILL play a crucial role in the 9/11 deception. Don't worry about missing out on the sale, K.
Just take an average old i-beam section from a demolition site and make up a heroic story about it. The professionals do it that way. The USS NEW YORK (LPD 21), built with 7.5 tons of steel from the World Trade Center in her bow, was commissioned in New York City on Nov. 7, 2009. At approximately 8:00 a.m., on November 2, the USS NEW YORK came to a standstill across from the World Trade Center site, dipped her flag, and delivered a 21-gun salute. Members of the Fire Department of New York, the New York Police Department, Port Authority Police, members of the families of 9/11 victims and veterans gathered on the shore at the North Cove in the World Financial Center to return the salute. Members of the general public were in attendance. All very odd...I wonder if it's still afloat? On this 15th anniversary of the Great 9/11 Hoax, please take some time to share / diffuse the http://www.septemberclues.info website with all your friends and family. Please do not assume that your dear ones have already watched it / read it - and please do not think that your personal efforts to diffuse it are just an insignificant drop in the ocean. Also, do not fear to be called "tinfoil hats" by your acquaintances & loved ones - you'll be surprised at how many people are now ready to question 9/11. "NIST estimated the elapsed times for the first exterior panels to strike the ground after the collapse initiated in each of the towers to be approximately 11 seconds for WTC 1 and approximately 9 seconds for WTC 2." Here we are, 16 years and counting - and the definitively exposed 9/11 hoax still lives on ... on TV, that is. In reality, a vast proportion of the world's population - most probably a majority by now - knows full well / or strongly suspects that something is amiss with the official version of the events of September 11, 2001 - as presented by the news media. If you have come here for REAL information about the 9/11 hoax, I dare say you have done the right thing. Welcome. Here we are, 17 years and counting - and the definitively exposed 9/11 hoax still lives on ... on TV, that is. In reality, a vast proportion of this world's population - most probably a majority by now - knows full well / or strongly suspects that something is amiss with the official version of the events of September 11, 2001 - as presented by the news media. If you have come here for REAL information about the 9/11 hoax, I dare say you have done the right thing. Welcome. This forum is a righteous and virtuous one - totally peaceful, antiracist and devoted to the betterment of humankind. All we are asking for is that the folks behind the 9/11 hoax (and countless other media hoaxes designed to dumb down this planet's inhabitants) get rounded up and placed in a safely-guarded madhouse. On this forum, the madmen / psychopaths ruling this world (be they American, British, Jewish or of ANY other extraction or skin color) are known as the criminal members of the "Nutwork" - a neologism that I have coined many years ago. It is a wordplay on George Orwell's "Network" - which was the entity ruling this world in his distopic writings. 4-No "3000" people were trapped in the top floors/nor perished in the WTC towers. More than seven years of relentless investigations 'in search' for the purported victims of 9/11 have failed to formally identify (via public records, verifiable documentation or any other means) one single alleged victim of the events of September 11, 2001. It is certainly a day worth celebrating, since the extremely clumsy 9/11 hoax opened the minds of millions of people around the world - as to the senseless arrogance and stupidity of the power maniacs that pretend to rule this beautiful planet of ours. To those who still believe in the official tale of 9/11, I wish a speedy recovery from your seventeen-year-long hypnotic stupor.